I’m always looking for ways to be more productive! Sometimes a day goes by and I wish that I wish I had more hours in the day, or that I’d gotten more done. I have noticed that trend a couple of times lately, and decided to fix that problem. 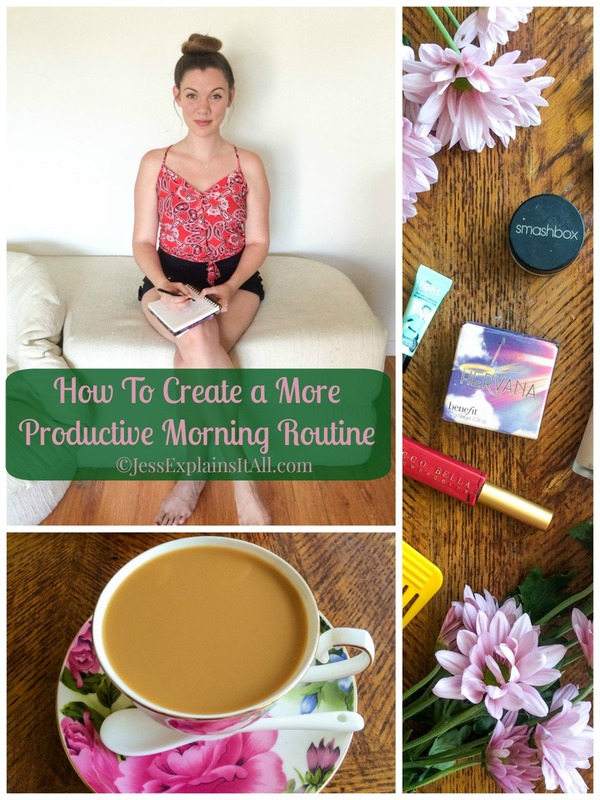 Creating a solid morning routine has helped me stay on track and have a more productive day! 1. Unplug – The first thing I’ve started doing – and this is crucial – is that I’ve stopped using technology for the first hour I’m awake. It’s so temping to wake up and reach for my phone, but it’s not necessarily the most healthy way to start the day. So instead of grabbing my laptop to check emails, or my phone to see my Instagram notifications I’ve turned to another source of creativity. 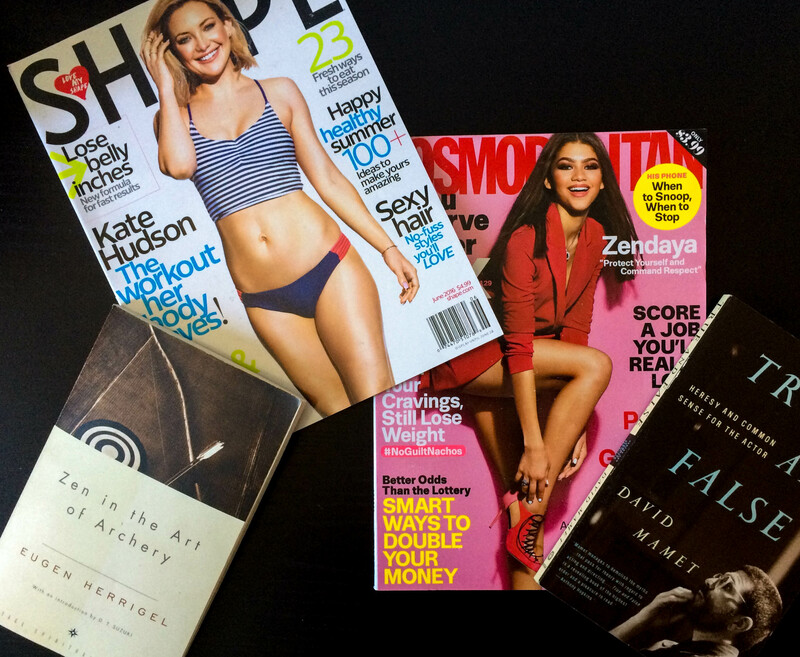 I have a stack of magazines and books on my nightstand, and when I wake up I pick one of them up instead of my phone! 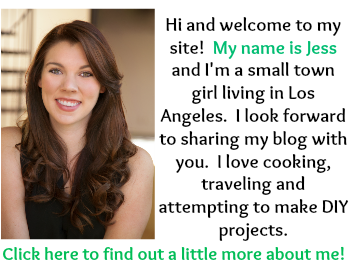 Speaking of email if you are interested in receiving my newsletter (after the first hour you’re awake, of course!) I just got it up and running. 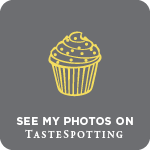 You can sign up at the top of my sidebar! 2. Hydrate – I am such a culprit of not drinking the recommended 8 glasses of water a day, but I find when I make more of an effort to stay hydrated I have more energy and am therefore much more productive! My rule of thumb for the morning is to drink two glasses of water before breakfast. The first one is to rehydrate my system after a long night’s sleep, and the second one is to fill my tummy a little so I don’t end up overeating for breakfast. I have been making all sorts of flavored water lately. I find that if I like the taste of the water, I’ll drink more of it! 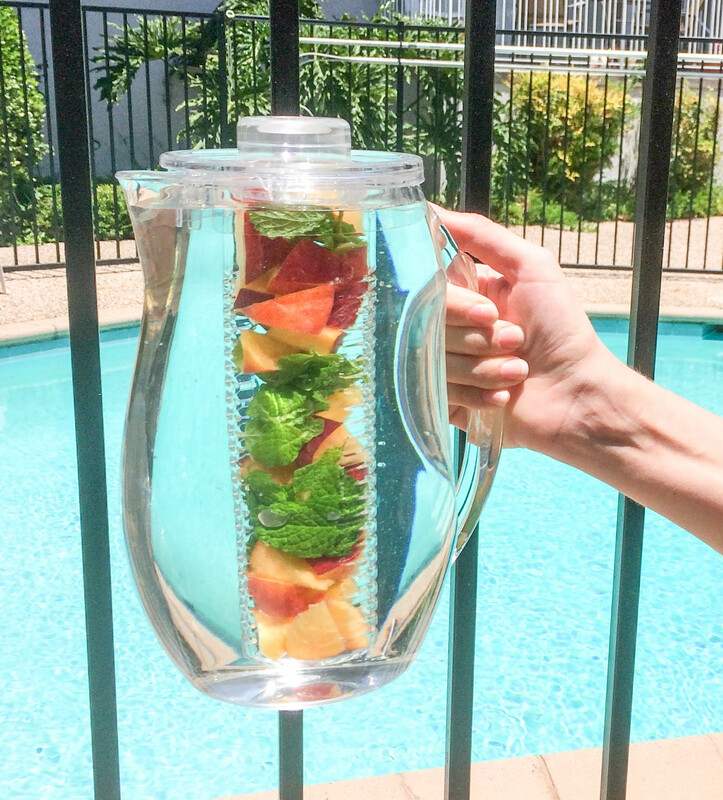 The photo above is for some mint and peach flavored water I made recently! If you follow me on Instagram, you’ve already seen a sneak peek of this photo! ?? 3. Get Outside – Speaking of breakfast, I always go outside in the morning to eat my breakfast. I have a little balcony that overlooks the pool in our apartment complex, and while it’s not the biggest space, it feels good to be outside to start the day! I love the feeling of having fresh air around me first thing in the morning. I put on a positive playlist and have a cup of coffee with my breakfast outside. Then when I’m done I water my plants. I have a little herb garden that thrives from a little love in the morning! It’s been so hot lately that my plants need to be watered often. 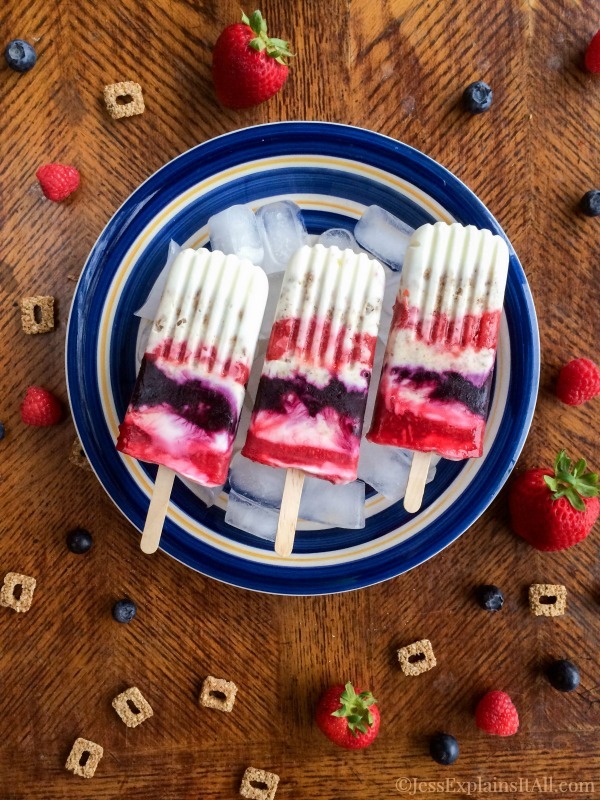 Also, if it’s as hot where you are as it is in LA, definitely check out my recipe for Yogurt Parfait Breakfast Popsicles pictured above – they’re a good way to cool down! 4. Jumpstart Your Energy – If you know me, you know that I love a good cup of coffee in the morning. 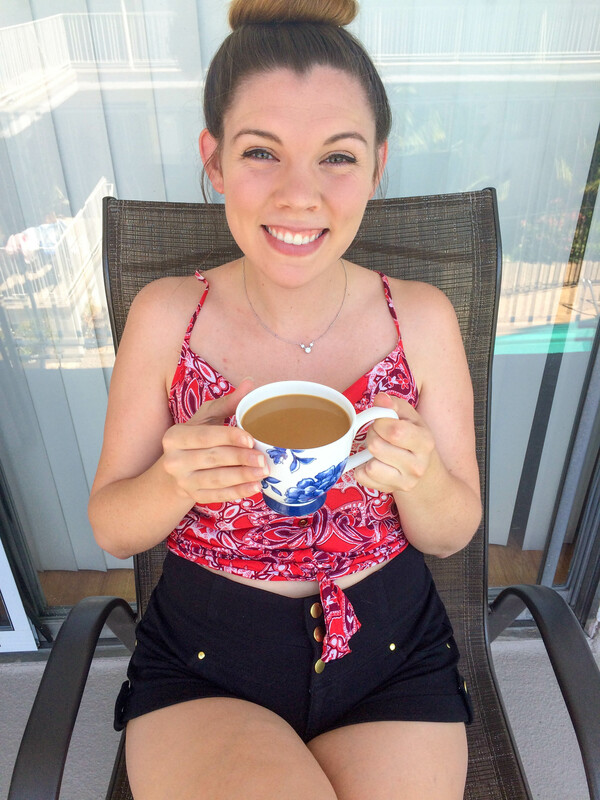 Having a cup of coffee gives me a little boost of energy and starts my day off on the right foot! 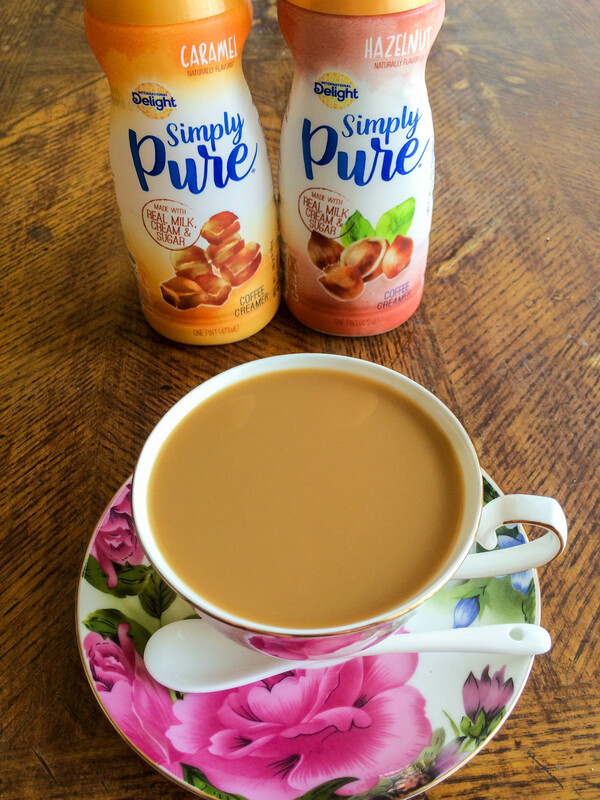 I’ve recently been mixing up my coffee routine by adding Simply Pure Coffee Creamer to my cup o’ joe! I love this creamer (the caramel flavor is to DIE for) because it gives my coffee so much more flavor. It’s so smooth and sweet it makes me feel like I’m having a latte in the morning! Plus, it only has five ingredients – including milk, cream and sugar! 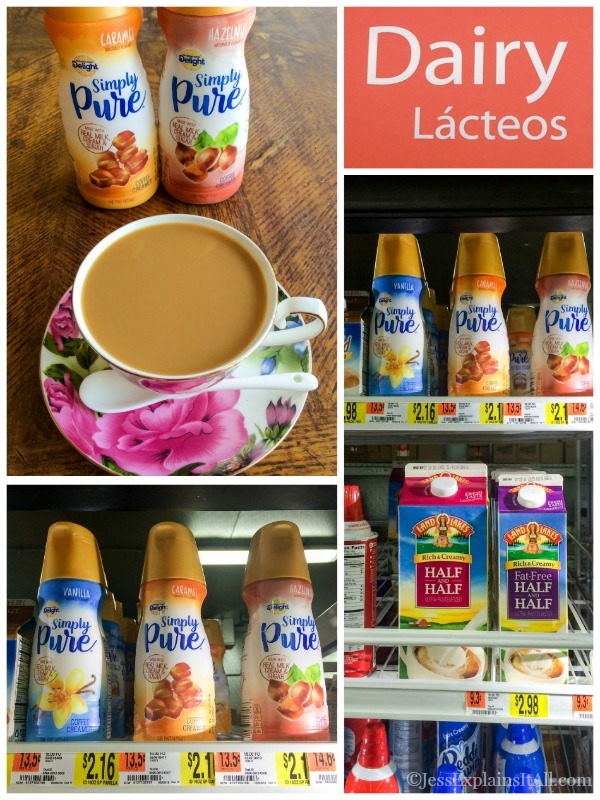 If you use creamer or milk in your coffee I highly suggest checking Simply Pure Coffee Creamer out! You can find it at your local Walmart in the dairy aisle! You can find out more about it here and check out more simply pure inspiration here. 5. Dress for Success – Ok, so this one is going to be slightly different for everyone. In an effort to have a more day, I dress for the day I want to have. If I stay in my PJs all day, I find I get much less done than if I take a shower as soon as I’m done with breakfast and put on my makeup and a cute dress! For me “getting dressed” feels finished when I put on my makeup. I’m not saying by any means that you need to (or should) wear makeup! I just know when I get all dolled up it gives me a little boost of extra confidence and I feel like I can conquer the world! 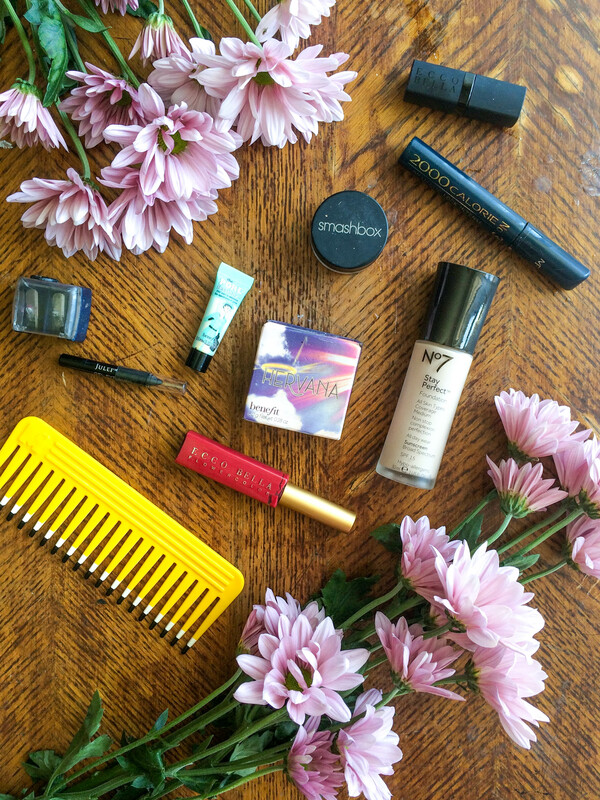 The photo above shows some of my current makeup favorites. If you’re digging that makeup photo, make sure you take a peek inside my medicine cabinet to see some more products I love! Make a Plan – I think I get the most done in a day when I have a concrete plan. I have found that sitting down and actually writing what I want to get done in the day makes those things so much more likely to get done. If I see everything I need to do that day, my mind starts to instinctively make space for those things! It only take a couple of minutes to make a list, but it really makes a difference in how productive I am for the rest of the day! Are you still finding mornings to be difficult? 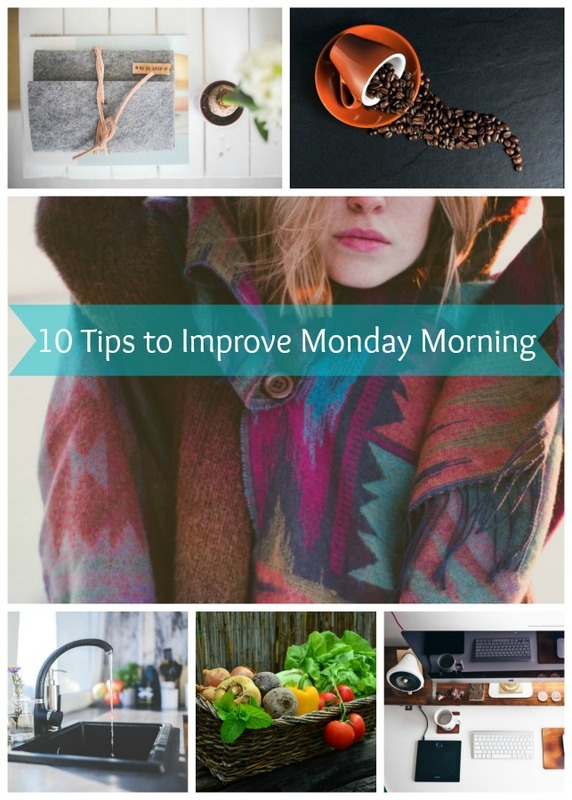 Monday mornings are probably the hardest, but they don’t have to be with my list of 10 Tips to Improve Monday Morning! Feeling blue? 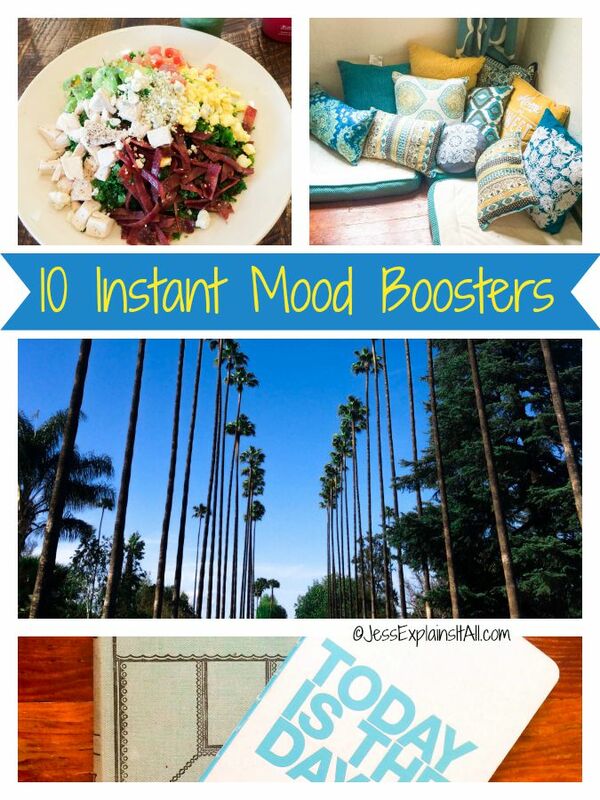 Check out my list of 10 Instant Mood Boosters to brighten your day! Great tips! I always love to read about morning routines as I am always tweaking mine. Couldn’t agree more about not reaching for the phone first thing, I am trying to implement that by keeping mine in another room when I go to bed. Ah, I wish I could keep it in another room, that would make it so easy!! What a great tip! I use mine for my alarm clock though, so I have it plugged in on my nightstand. It means using so much will power at first not to check it. But it does get easier! You look fab babe. I am loving the bun too. And thanks for the tips. I find myself having a hard time drinking 8 glasses of water a day as well but heres to the new day for trying it again! I’m glad you found it helpful! And that’s honestly the hardest thing I’ve been trying to implement into my routine, but it’s been the most helpful. I never realized how much time I spend checking my phone in the morning!! You can not go wrong with coffee and I love your bun! 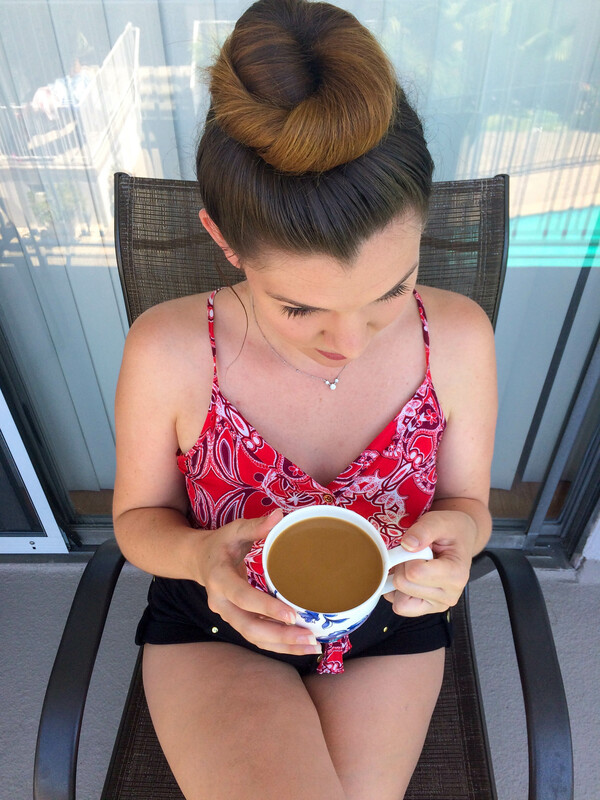 haha we sound like we would be fast friends – coffee and a high bun are two major loves in my life! ? Thanks so much! And yes – I’ve found starting the day with productivity increases the amount I get done in the entire day! Do you have a full time job outside your home? How do you leisurely do this and be at work by say, maybe 8:00 am? Thanks for the question, Kathy – I do have a full time job outside of the house in addition to running this blog. I can absolutely sympathize with you – it’s hard to find time to fit in a morning routine, but if I stick to the points I’ve listed above I find that I actually save time in the morning. Since we’re all so short on time, I’m happy to create a morning routine that makes me more productive during the day. 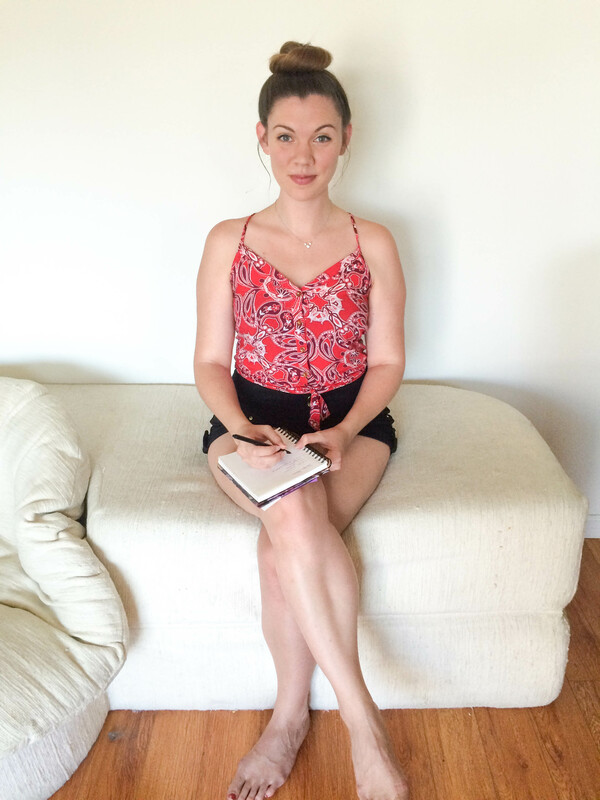 I find that if I start off on the right foot, that I can fit everything I need to in my day. If you’re having trouble creating a morning routine for yourself, I suggest going to bed earlier. I know it’s no fun, but I found that when I went to bed earlier at night, that I was able to have enough time in the morning to create my routine! Good luck!